Back in the day, when a couple with children got divorced, by and large, the children went to the mother. It was called the “child of tender years” doctrine, and meant that children, especially young children, should not be separated from the mother. The father had “visitation,” usually every other weekend and maybe an evening or two during the week. Frequently, the mother could stay in the house with a sale required in the future. One Milwaukee County Judge, Lee Wells, had a four year rule, which he explained was the time when a new president was elected and — in those days — a new coach hired for the Packers. Today, much has changed, including the nomenclature. “Visitation” has been replaced by “physical placement.” “Custody” has come to mean “decision-making” and is almost always awarded jointly. If one parent cannot buy out the other’s interest in the home and refinance the debt on it, the house is usually listed for sale immediately. More importantly, except in cases where geographic distance makes it impossible or one parent is not capable or interested in joint parenting, equal time with the children has become the norm. In my practice, it has become common that when parents initially contact my office for a lawyer, the parents have already agreed to equal time with the children and frequently have already implemented it. Has shared time truly become the norm? Is it mandatory? Most importantly, is it a good thing? We will examine these questions as part of a two-part series in this column, first examining the current status of the law and then discussing whether we have arrived at finding the best interests of minor children whose parents are divorcing. Despite the popular misconception, the law does not require equal shared parenting. 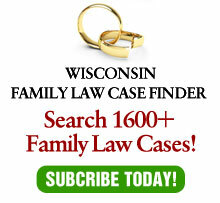 Rather, the statute requires the court to “set a placement schedule that allows the child to have regularly occurring, meaningful periods of physical placement with each parent and that maximizes the amount of time the child may spend with each parent, taking into account geographic separation and accommodations for different households.” Wis. Stats. §767.41(4)(a)2. This language was a political compromise. Father’s rights groups had lobbied for a statute that mandated equal placement in most cases (the notorious “SB 180”). Instead, a compromise was reached which can be read in various ways. In and of itself, it makes no sense. After all, if you “maximize” the time with one parent, isn’t that mathematically “minimizing” time with the other, since placement is a zero sum game? The compromise was masterful language since the father’s rights groups could read it as mandating equal placement while others might interpret it differently. Which is exactly what occurred. Subsequent case law has made it clear that equal placement is not mandatory by statute. See Keller v. Keller, 2002 WI App 161, 256 Wis. 2d 401, 647 N. W. 2d 426; Landwehr v. Landwehr, 2006 WI 64, 291 Wis. 2d 49, 715 N.W.2d 180. Nor is it constitutionally required. Lofthus v. Lofthus, 2004 WI App 65, 270 Wis. 2d 515, 678 N.W.2d 393. Yet, time and again, absent extreme circumstances, such as allegations of physical or substance abuse or geographical impossibility, dividing children seems to be formulaic – equal placement unless one side is not so interested. If the law does not require equal placement, why is it happening? Certainly, the father’s rights groups have something to do with it. After all, if women groups can advocate for gender equity when it comes to employment and pay, can’t men’s groups do the same when it comes to their children? Essentially, the legal system is simply following the sociological trend towards a gender-neutral society. At the same time, a realization seems to have set in the legal community that contested custody trials were harmful to children. In addition, while psychologists are helpful in diagnosing personality disorders, nothing in their professional training makes them any more qualified to divide a 14-day schedule than anyone else. Finally, an attitude, for better or worse, seems to have swept society that litigation is a terrible way to settle disputes. So, adding the costs of litigation to harm to children, the lack of expert assistance, and the general trend towards shunning litigation, the result is that everyone is looking for a way out of custody disputes. The easy way, once gender is taken out of the equation, is to divide time equally between the parents. So, this has been the trend. Is the easy way a positive or negative for children? Next week we’ll discuss the pros and cons.